"I'm not racist but..." We have all heard someone start a sentence off with this justification and the statement often means that this person is, indeed, racist. This mentality can also be applied to cheerleaders. Not that cheerleaders are racist. No, I would never infer that. 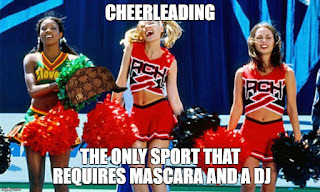 Although, I'm sure some cheerleaders are racist? Probably? 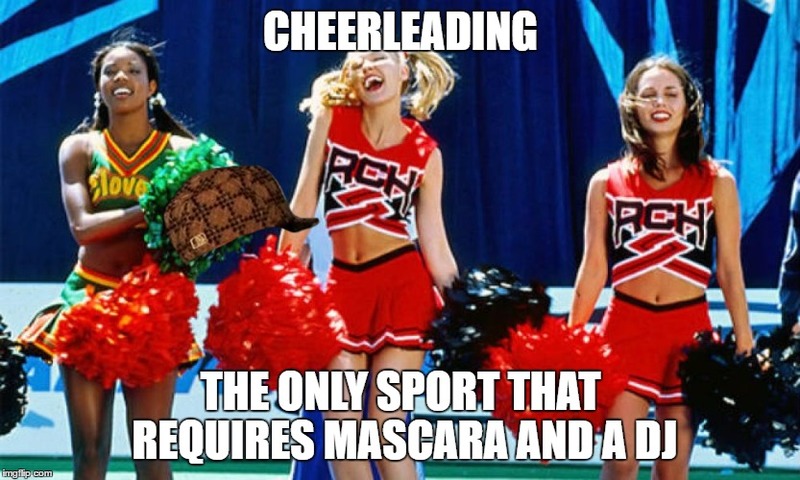 I mean, we've all seen the film Bring It On and almost ALL of those cheerleaders were racist. Ok, I think it's a fair statement to say that SOME cheerleaders are racist just like saying SOME beet farmers are Jedi Knights....I mean, it's statistically plausible. Alright, this has clearly escalated so let's forget about racism for just one second and then after that second has passed I will let you get back to your regularly scheduled racism. If you have to remind people that you aren't racist it's because people assume that you might be racist. Here is that same justification applied to a different situation. If you have to remind people that your sport is a sport then that activity is not a sport. I recently watched a sports section of the news which covered everything from wrestling to football and ONLY cheer leading felt the need to scroll the phrase "CHEER LEADING IS A SPORT" across the screen. Apparently, the viewers did not need to be reminded that hockey is a sport or baseball, swimming, tennis, soccer....you know, sports. There are so many reasons why cheer leading is not a sport but here are just a few. These simple guidelines will also help you define other ambiguous activities as SPORTS or NON-SPORTS. Ask yourself these questions when determining whether or not an activity is a 'sport' or not. Does the 'sport' in question have playing cards of famous players? Does the 'sport' have famous players? Are there any 'fantasy leagues' associated with this pass time? Is there a team mascot? Does the 'sport' have fans? Are these 'fans' your mom and other cheer leaders? Are hot dogs and hamburgers sold during these 'sporting' events? Could you purchase season tickets or box seats to this 'sport'? Does illegal betting take place before or during this 'sport'? Does this 'sport' have intramural leagues after college? Must you rise for the singing of the National Anthem before official play begins? I have surmised that according to these guidelines cheer leading does not fall under the category of 'sport' but under 'non-sport' or 'athletics'. Don't be sad cheer leading. You stand amongst other great 'non-sports' such as hiking, synchronized swimming, speed walking and ice-fishing. At least you're not racist...that we know of. P.S. Do NOT Google 'Racist Cheerleaders' unless you want to find ACTUAL racist cheerleaders. You have been warned.